A Central Persian prayer rug, early 20th century, the pictorial mihrab with an exterior scene of figures, a horse and deer, surrounded by ascending flowering trees and birds above a stylized pond with fish and ducks, within a cartouche border enclosing vignettes of birds, plants and winged figures to each corner, 205cm x 139cm. Provenance: formerly owned by Alphonse Mingana, ethnic Assyrian theologian, historian and Syriacist, thence by descent. Note: Mingana is best known for collecting and preserving the Mingana Collection of ancient Middle Eastern manuscript, which is now housed at Special Collections, University of Birmingham. 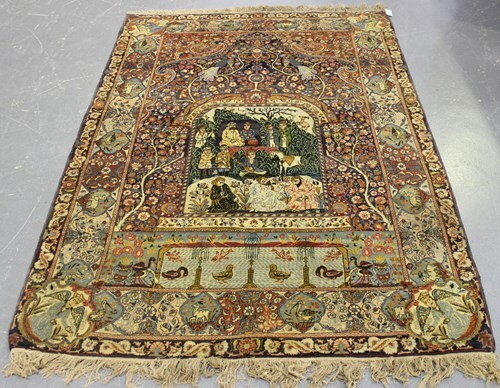 An Afshar rug, South-west Persia, early 20th century, the midnight blue field with overall offset rows of stylized boteh, within a flowering vine border, 185cm x 134cm. 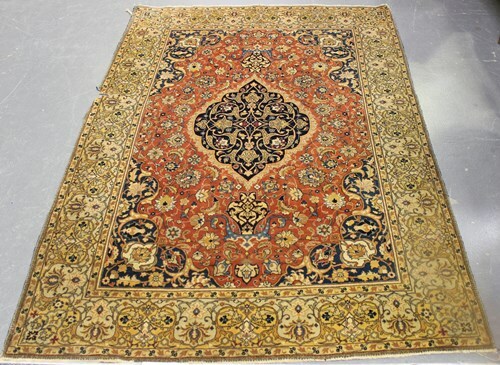 A Tabriz rug, Central Persia, early 20th century, the terracotta field with a shaped blue medallion, profusely supported by flowering vine and palmettes, within an ivory scrolling vine border, 202cm x 141cm (faults). 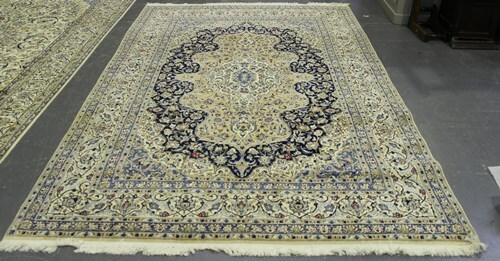 A modern machine made Kashan style rug, the dark blue field profusely decorated with palmettes and vines, within a complimentary border, 230cm x 160cm. 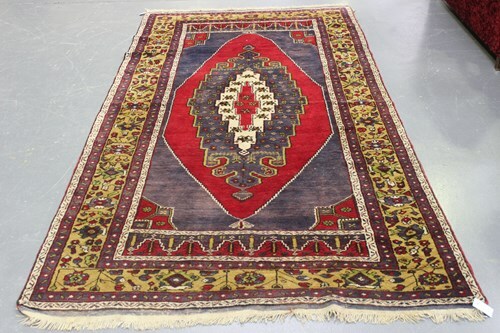 A Turkish kelleh, mid-20th century, the aubergine field with a red reserve and angular medallion, within a palmette and flowerhead border, 292cm x 157cm. 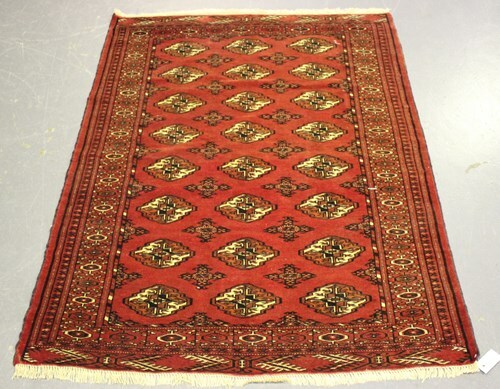 A Heriz carpet, North-west Persia, mid-20th century, the faded red field with a large bold medallion, within ivory spandrels and a palmette border, 333cm x 262cm. 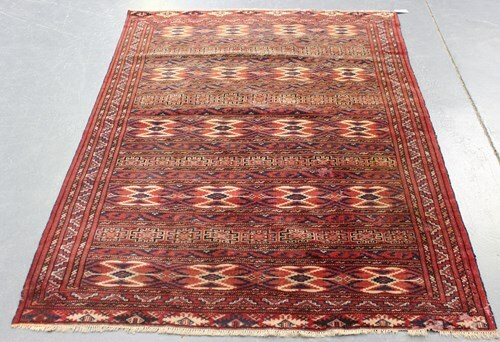 An Afghan rug, mid-20th century, the deep claret field with two columns of guls, within a lozenge border, 258cm x 156cm. 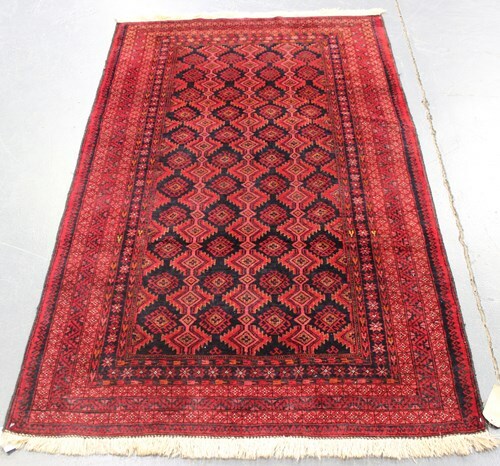 An Afghan bokhara rug, mid-20th century, the red field with three columns of guls, within a sunburst gul border, 159cm x 115cm. 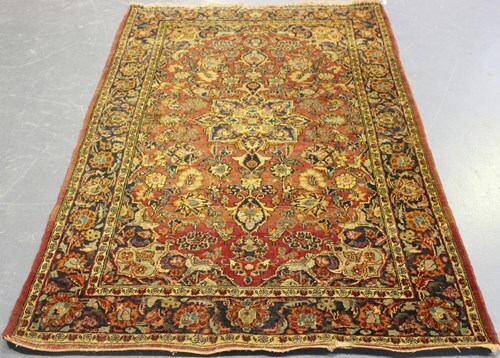 A Kashan rug, Central Persia, mid-20th century, the chestnut field with a flowerhead medallion, within a palmette and flowerhead border, 203cm x 131cm. 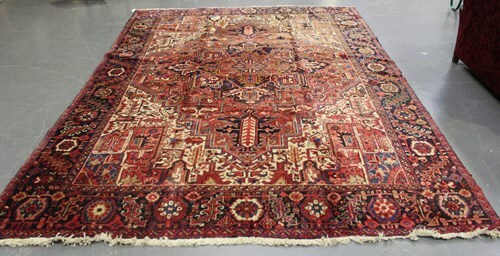 A Hamadan rug, North-west Persia, mid-20th century, the charcoal field with an angular medallion, within an ivory cartouche border, 165cm x 109cm. 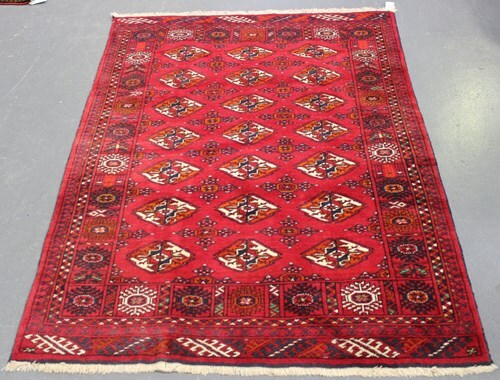 A Pakistan bokhara style rug, mid/late 20th century, the red field with three columns of guls, within a complimentary border, 155cm x 120cm. 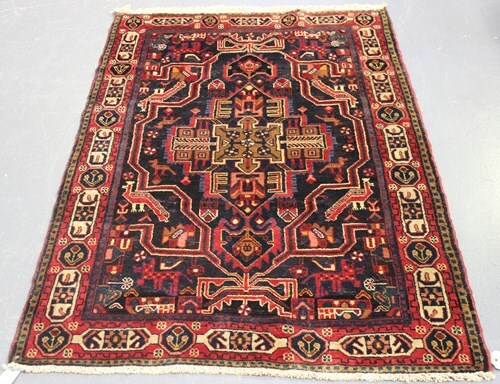 A Beluche rug, Afghan/Persian borders, mid-20th century, the midnight blue field with overall offset rows of guls, within a complimentary border, 193cm x 112cm. 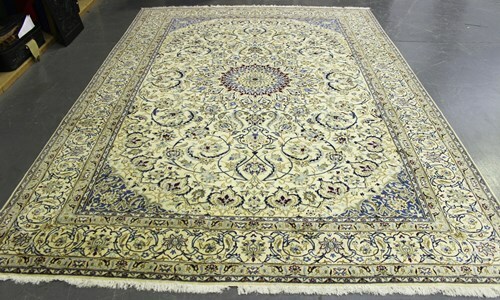 A Nain carpet, Central Persia, modern, the midnight blue field with a large shaped reserve and medallion, all decorated with palmettes, flowers and leaves, within an ivory border, 317cm x 216cm. 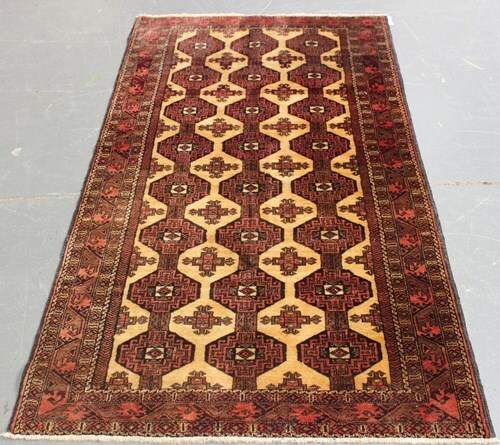 A Beluche rug, Afghan/Persian borders, late 20th century, the camel coloured field with three linked columns of guls, within a complimentary border, 200cm x 107cm. 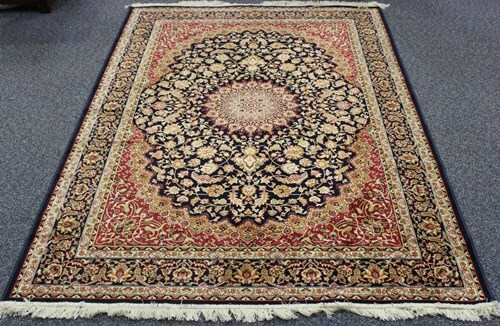 A Nain carpet, Central Persia, modern, the ivory field with a circular medallion profusely supported by scrolling tendrils issuing palmettes and curled leaves, within an ivory complimentary border, 360cm x 257cm. 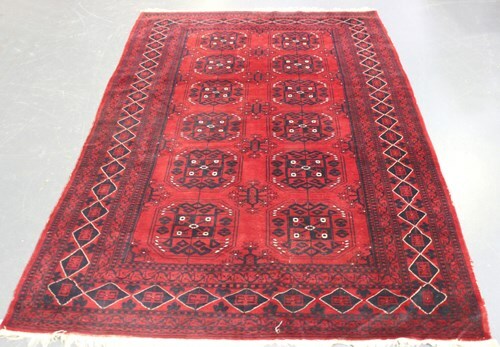 A Turkestan rug, early 20th century, the pale claret field with overall geometric banded decoration, within a complimentary border, 190cm x 141cm. 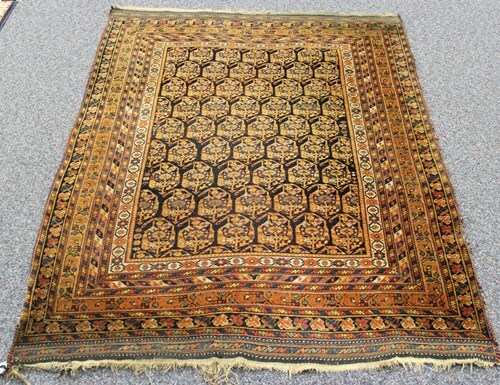 A Heriz carpet, North-west Persia, mid-20th century, the ivory field with a large bold medallion, within a charcoal flowerhead and curled leaf border, 380cm x 270cm. 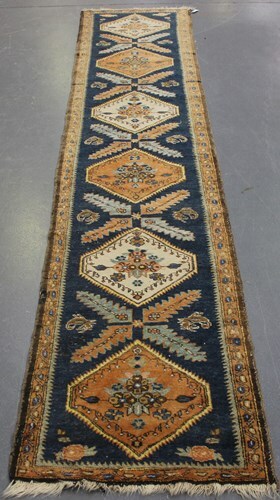 A Turkish runner, early/mid-20th century, the blue field with a column of stepped medallions supported by serrated leaves, within a complimentary border, 394cm x 72cm. 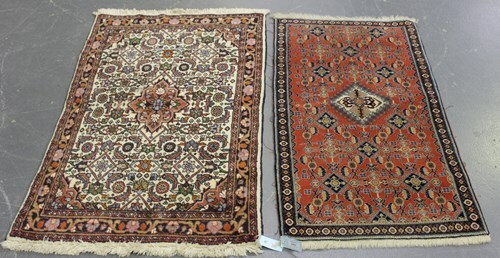 An Erivan style rug, late 20th century, the pink field with a lozenge medallion, profusely supported by flowerheads, curled leaves and hooked guls, 113cm x 62cm, together with another rug, 121cm x 76cm. 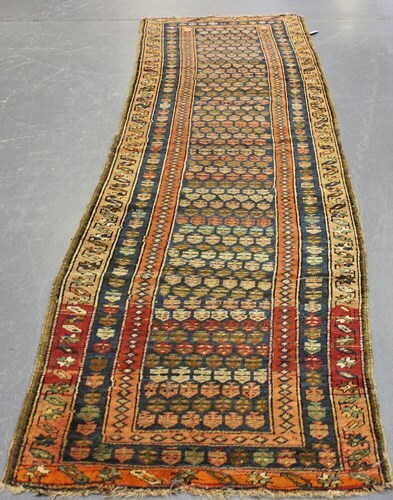 A Kurdish runner, early 20th century, the blue field with overall offset stylized boteh, within a complimentary border, 327cm x 95cm.